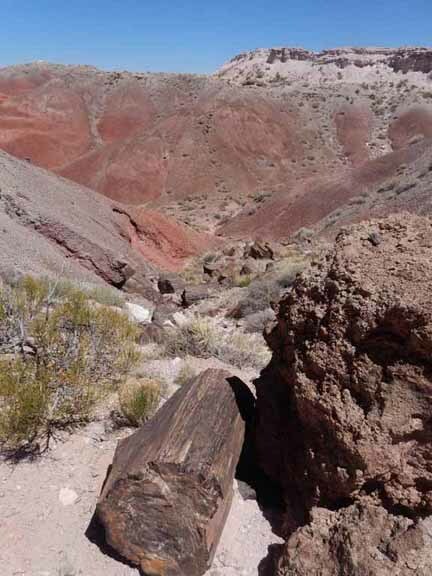 After our unplanned side trip to Snowflake, AZ we arrived at the Petrified Forest. 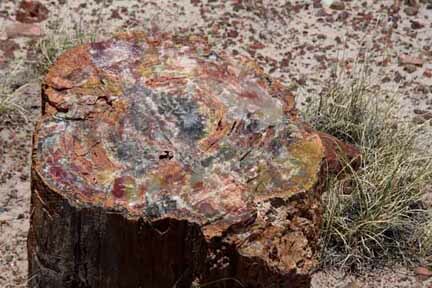 It is the largest collection of petrified wood in the world and it is amazing to see. Many, many millions of years ago there was this huge mass of land on our planet known as Pangea. 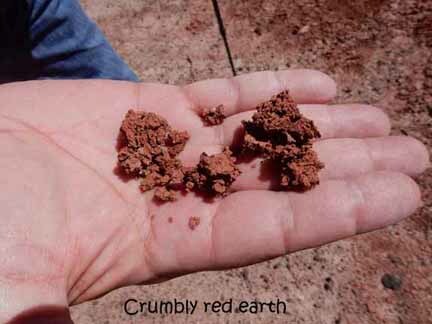 Over time it broke apart and chunks of land mass were pushed distant forming North America, Central and South America, Africa, Europe, Asia, Australia and Antarctica, with a lot of other "litter" spread around. 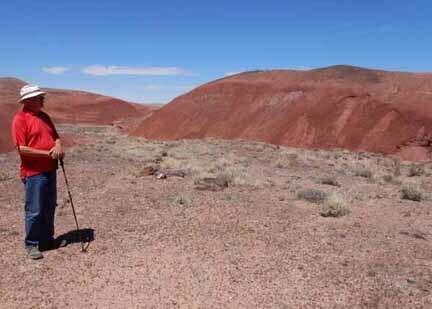 Arizona, in Pangea, was once near the equator and wet and warm. 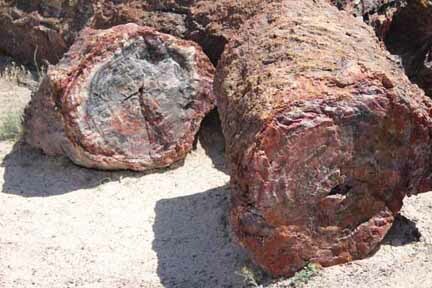 What you see at Petrified Forest are the remains of huge rain forest trees well over 200 million years old. They grew alongside dinosaurs...They became preserved when the earth's movement forced Pangea to break apart. The trees were knocked over. 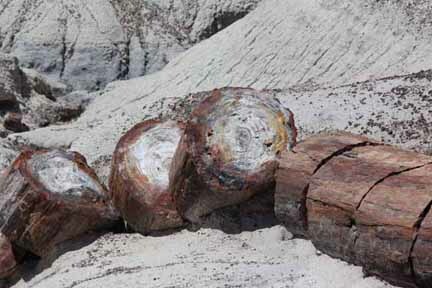 Covered in water and a silica rich mud, they petrified as the silica replaced the wood fibers and fossilized, turning into stone. 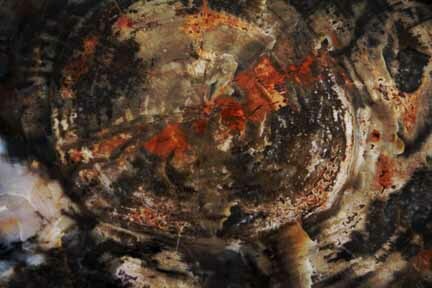 Minerals in the mix gave this stone a boggling and beautiful array of color and crystal. Erosion finally brought many of these ancient trees to the surface of the land within the park. Some of the logs appear to be culprits of some saw happy logger but they are victims of their own weight as they emerged from the land and split cleanly apart into sections. 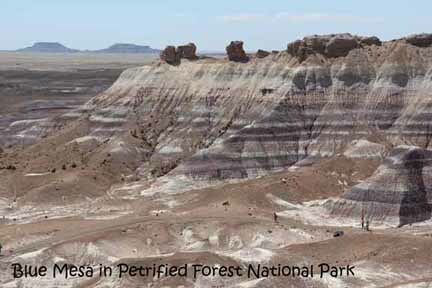 Petrified Forest Park has another feature and that is The Painted Desert. A short drive and the landscape totally changes. Pictures describe it best. Cathy and I took a great hike down into one of the painted areas. 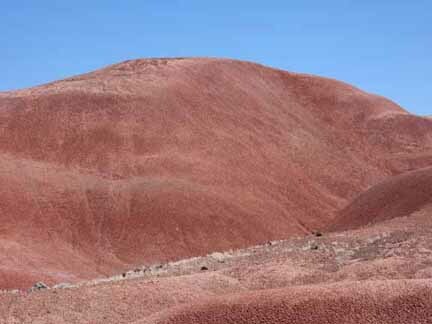 It is a surreal, otherworldly environment. 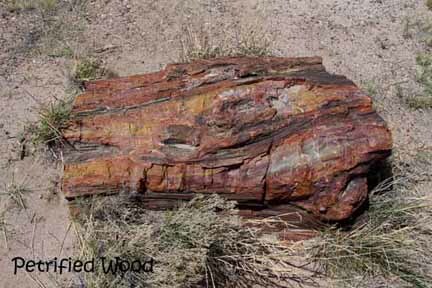 Holbrook, where we camped, is the epicenter of the world for retail petrified wood, gathered from private lands that border the park. 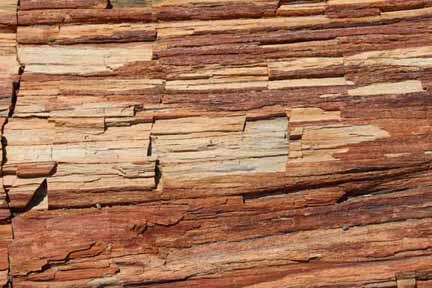 You can buy a nice 1200 pound log chunk with a polished top for a mere $7,500.00. But then, you have to ship it home. I would dearly love to have one for a backyard table for wine and cheese gatherings, but I'll just put out a photo for the occasion.